In 1951, the eight o’clock nightly news reported on Jean-Paul Sartre for the first time. 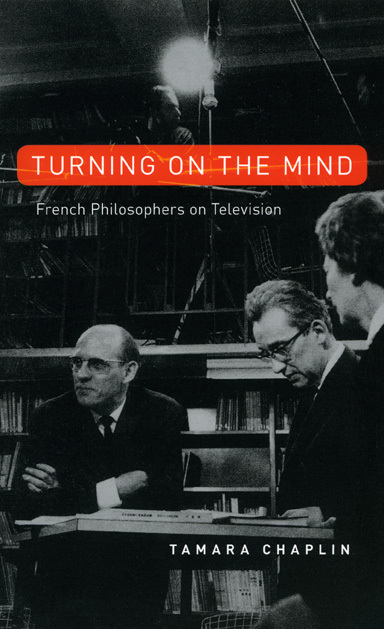 By the end of the twentieth century, more than 3,500 programs dealing with philosophy and its practitioners—including Bachelard, Badiou, Foucault, Lyotard, and Lévy—had aired on French television. According to Tamara Chaplin, this enduring commitment to bringing the most abstract and least visual of disciplines to the French public challenges our very assumptions about the incompatibility of elite culture and mass media. Indeed, it belies the conviction that television is inevitably anti-intellectual and the quintessential archenemy of the book. Chaplin argues that the history of the televising of philosophy is crucial to understanding the struggle over French national identity in the postwar period. Linking this history to decolonization, modernization, and globalization, Turning On the Mind claims that we can understand neither the markedly public role that philosophy came to play in French society during the late twentieth century nor the renewed interest in ethics and political philosophy in the early twenty-first unless we acknowledge the work of television. Throughout, Chaplin insists that we jettison presumptions about the anti-intellectual nature of the visual field, engages critical questions about the survival of national cultures in a globalizing world, and encourages us to rethink philosophy itself, ultimately asserting that the content of the discipline is indivisible from the new media forms in which it has found expression. "[A] vivid, thorough, and irreverent cultural history." "Chaplin’s fascinating study lifts the curtain on the secret life of French philosophers. . . . In the process, she raises some fundamental questions of whether complex thought can be communicated in the limited time frame of a television programme, and what happens to philosophy when it is presented in embodied form."